My Facial Skin Is Flaking Off, Is It A Scabies Symptom? Flaking facial skin can be an indication of a host of skin infections. But it should not be taken lightly at any cost. Scabies is a very contagious skin disease that is spread by skin to skin contact. It is caused by the Scabies mites. Itchy and flaky skin is one of the symptoms of Scabies. Scabies infection can be seen in the cleanliest of houses and in the dirtiest of neighborhoods. It can be seen in somebody who takes a bath daily and somebody who doesn’t. It is one of the most common skin infections in the world. Normally, people like elderly and children are more prone to it as their immunity levels are low. The common areas of infection are soles of the feet, abdomen and fingers. It is very rare for Scabies to infect the area above the neck. But if a red rash is seen and it is itching, consult a doctor right away. Scabies that goes untreated develops crusts on the surface of the skin and is called Norwegian or Crusted scabies. 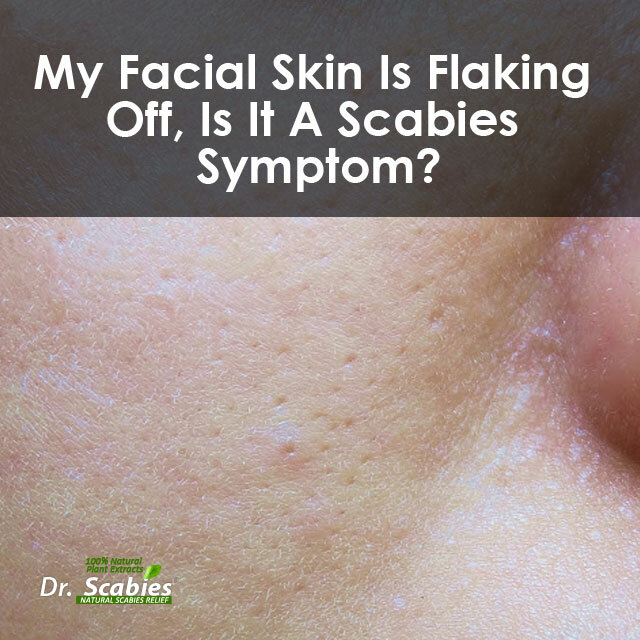 Flaking facial skin is a symptom of this kind of scabies. It can also be accompanied with mild itching and hair loss. Treatment at this stage is a requisite or may lead to other complications. The only way to control Scabies is by getting it diagnosed at the right time and treating it with the right product. All over the world people are trusting Dr.Scabies to provide them with relief from the itching and complete eradication of the infection. This entry was posted in facial skin scabies, flaking skin, scabies symptom, scabies treatment. Bookmark the permalink. Crusted Sores On The Hands? Do I Have Scabies?